about this book: Kat can't catch a break. 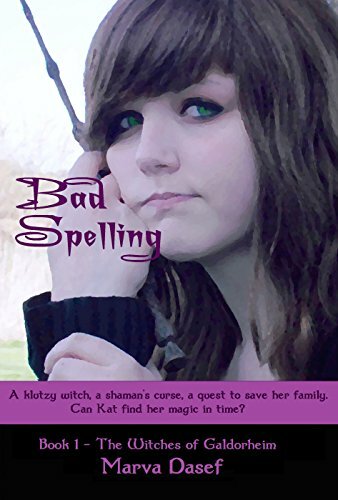 Her mother, brother, and aunt are super witches, but Kat can screw up the simplest spell. Her poor familiar, Teddy the Bunny, puts up with being turned into a half-frog, half-rabbit pile of green goo among other indignities. Every spell just goes wrong, wrong, wrong. Everyone knows she's got the power, but assume she isn't trying hard enough to master the principles involved in witchcraft. The fault might just be her dead father. A Siberian fisherman, he didn't have a lick of magic, but her mother loved him anyway. Now that dad is buried in a ice cave, Kat decides to find her father's family. Maybe they'd take her since she sure doesn't belong on an arctic island run on magic. Her super warlock, half vampire brother Rune decides she can't get along without his magic, so the two of them set out across the frozen Barents Sea to Norway, then by troll train to Siberia where her father's family lives. Along the way, Kat makes some unusal friends, figures out how to use her magic and falls for a changeling troll. Beauty is, as everyone knows, only skin deep. • "There is also a larger narrative in the book which is intolerance." — Vixenne Victorienne "Kymberlyn Reed"